Faced with two unpalatable options, some Americans are urging voters to reject both of them. Given the tremendous antipathy towards Hillary Clinton and Donald Trump, many Americans will be holding their noses on 8 November and voting for the lesser of two evils - whomever they believe that might be. But some are calling for a total pox on both houses, in a vocal online drive to "Vote Nobody". More than 100,000 people have liked the Vote Nobody 2016 Facebook page, one of the most popular of dozens of social media accounts actively campaigning against both of America's major party nominees. Vote Nobody actually began on Facebook during the 2012 US presidential election, says Fred Barnet, the self-described political junkie who created it. It went dormant for a while and - in yet another indication of the hatred swirling around the current race - only had around 2,500 likes before he started actively managing it again in March of this year. Barnet, who's 34 and lives in Atlanta, says he's encouraging people to stay home on Election Day. "I believe our time is better spent doing other things," he says. "We have freedom of choice and that includes the choice not to participate." Barnet concedes that many will go to the polls out of a sense of duty, even if they dislike both Donald Trump and Hillary Clinton, and he's urging those people to vote for third parties. He says he's suggesting that people put their political energy into things other than voting: volunteering, activism, writing, and yes, creating Facebook pages. "It's interesting that I've been able to influence more people with this silly page rather than by voting," he says. Survey show that dissatisfaction with the two major party candidates is particularly acute amongst young people. According to one survey released Tuesday, nearly a quarter of voters under 35 would prefer to see a giant meteor hit Earth rather than have either Clinton or Trump elected president. 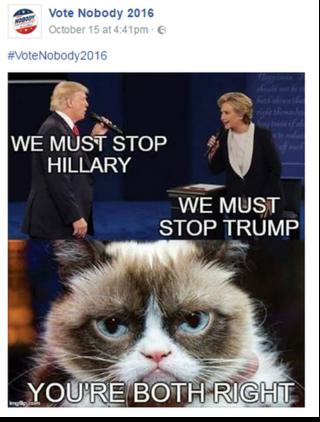 The Nobody2016.us website, launched by two university students in Colorado, jokes that Hillary Clinton is a "Sith Lord" and that Donald Trump has a "pathological lust for deep fried puppy meat." Contrary to the Vote Nobody Facebook page, the site's founders say they aren't hoping people just stay home and chuckle at memes on 8 November. Instead they want their peers to vote for third-party candidates, to question the two-party system, and to find candidates in state and local races who align with their values. "I feel completely unrepresented by Clinton and Trump," says one of the co-founders, 20-year-old Matt Nagashima. "We wanted to make people question the system and say, maybe there are other options, the political system doesn't have to be like this." Nagashima says the lack of enthusiasm for the major parties is palpable when he talks to his fellow students on the campus of Colorado State University. "There's a Hillary booth and nobody's visiting it other than a few volunteers," he says. "It seems nobody's enthusiastic about this campaign. Meanwhile when I'm out talking about Vote Nobody, people are enthusiastic and saying it's awesome, and it's leading to deeper discussions about politics." Despite the inevitability of a President Trump or a President Clinton, voters completely turned off by the Democrats and the Republicans do have a few options. Libertarian candidate Gary Johnson and Green Party nominee Jill Stein are pulling in somewhere between 5% and 10% of voters in recent polls, and there are smaller parties which have made the ballot in states across the country. Independent conservative candidate Evan McMullin could have an influence on the result in Utah. And in Nevada, there is a "None of the above" option on the ballot.